Plush furnishings, subdued lighting, mahogany woodwork and detailed frescoes together create an inviting atmosphere of casual elegance at The Bivouac. Add fresh, inventive cuisine and an ever-evolving seasonal menu and the stage is set for an unforgettable dining experience. Prepared as artistic representations, all dishes are made of only the freshest ingredients and presented in the utmost creative and meticulous manner. 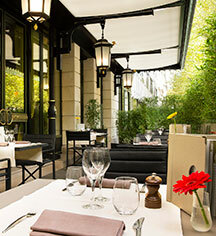 From smoked salmon aperitifs to seasoned steak entrees to fresh fruit crêpes, the menu caters to every patron’s whim. Guests enjoy sipping cocktails and sharing the appetizer of the day next to the warm hearth, drinking wine and portioning savory dishes on the interior courtyard, and relaxing with precisely prepared cappuccinos in oversized armchairs. 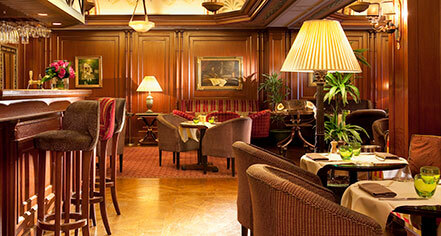 Breakfast, lunch, homemade decadent pastries, and four o’clock high tea is available every day. For a more intimate breakfast, guests are welcome to order and enjoy The Bivouac culinary masterpieces from their guestroom terrace while marveling over the stunning Parisian cityscape.